Lock in a great price for Four Seasons Hydra Luxury Suites – rated 9.3 by recent guests! This was a gorgeous villa by the beach! The staff was INCREDIBLY kind, so nice and sweet! The beds were very comfortable and the kids loved the couch that became a bunk-bed! Sophia and the staff at Four Seasons were wonderful. It was our honeymoon and they made our stay all the more special with their friendliness and excellent service. Thank you! 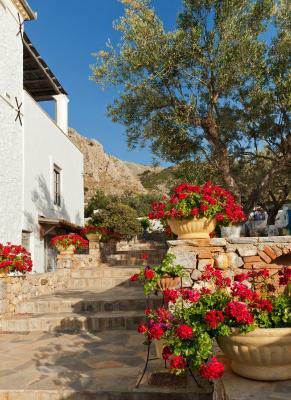 The Four Seasons in Hydra is extraordinary; absolutely exquisite natural beauty all around--sea, mountains, gardens. Great care has been taken in the design and upkeep of the property, inside and out. The staff is kind, caring and helpful. You know it is an amazing property when locals and international travelers come to rent chairs and umbrellas and enjoy the beach for the day. The staff were amazing. The place was VERY clean. Wonderful setting; peaceful and quiet and the restaurant was excellent. Would highly recommend this as a top place to stay when visiting Hydra. Will return to this place. Everything was amazing! Sofia and Rosa are the best! Pretty much everything, but the staff topped off a great stay. Four Seasons Hydra Luxury Suites This rating is a reflection of how the property compares to the industry standard when it comes to price, facilities and services available. It's based on a self-evaluation by the property. Use this rating to help choose your stay! 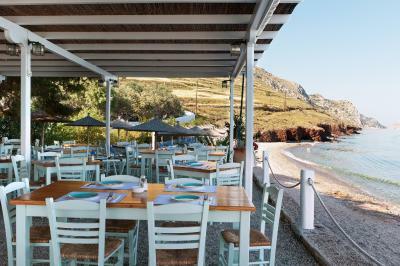 Located on a private beach in the area of Plakes Vlichos, Four Seasons Hydra Luxury Suites offers free Wi-Fi throughout. Its spacious accommodations has a furnished balcony or veranda with mountain or Argo-Saronic Gulf views. Individually decorated and fitted with wood beamed or paneled ceilings, the air-conditioned suites have an LCD satellite TV. A dining area and seating area with a sofa is also included. A breakfast is prepared daily. 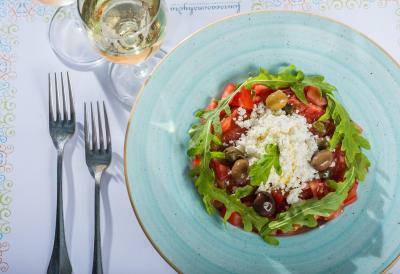 The on-site à la carte restaurant serves fresh fish, seafood, traditional Greek dishes and a selection of wines. Room service is also available. The hotel provides complimentary beach towels, sun beds and umbrellas. Guests can enjoy a book from the on-site library. 4 canoes are available for the clients free of charge upon availability. Staff at the 24-hour front desk can assist in arranging excursions such as hiking, while boat tours can also be arranged. Four Seasons Hydra Luxury Suites is 2.5 mi from Hydra Town and the port. Free boat transfers to and from the port are offered. A mini market is at 2,650 feet whereas taverns and cafes are less than 2.5 mi away. When would you like to stay at Four Seasons Hydra Luxury Suites? -dining area and seating area with sofa. Please note that this room type can accommodate a baby cot. A secluded property of 66 ft², surrounded by a garden. The two terraces offer mountain and garden views. The interior space, bright and in light pastel colors, consists of a small hall, a bathroom, a bedroom with double bed. Offers fireplace, satellite TFT TV, free Wi-Fi, safe and air conditioning. This air-conditioned suite features a flat-screen TV with satellite channels, private bathroom with free toiletries. This suite offers direct access to the garden. Mountain and garden view are offered. This double room has a private entrance, sea view and soundproofing. Featuring unobstructed sea views, this villa includes room service, beach towels and a welcome drink. Guests benefit from a small secluded beach right in front of the villa. Free transportation with the property's shuttle boats from 8 until 15:00 to and from the port of Hydra is also provided. House Rules Four Seasons Hydra Luxury Suites takes special requests – add in the next step! Four Seasons Hydra Luxury Suites accepts these cards and reserves the right to temporarily hold an amount prior to arrival. Kindly note that guests are offered free transfers to and from Hydra Port with the property's boat. Guests should arrange it with the property prior to their arrival. Please inform Four Seasons Hydra Luxury Suites of your expected arrival time in advance. You can use the Special Requests box when booking, or contact the property directly using the contact details in your confirmation. 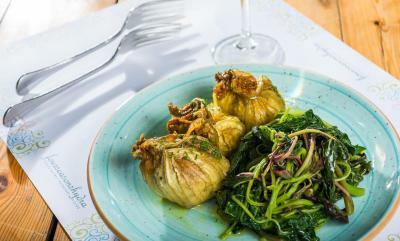 The kitchen was not really set up to be used and with two kids I was hoping to not depend on restaurants for everything! It was also pretty buggy which made useing the outside of the villa difficult. Everything has been exceptional / apart from the late night shuttle boat owner who was not so happy to take the boat from Hydra port to the hotel late in the night. 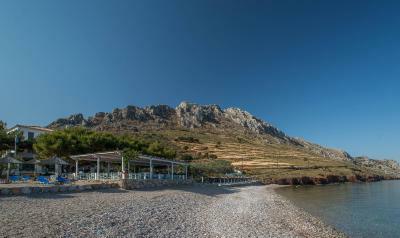 A unique place in Hydra with the most friendly staff providing excellent service. 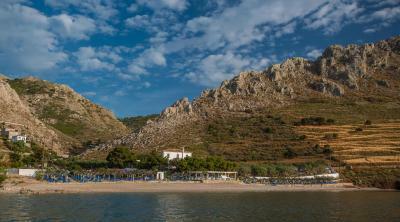 Great location by the beautiful beach of Vlychos. 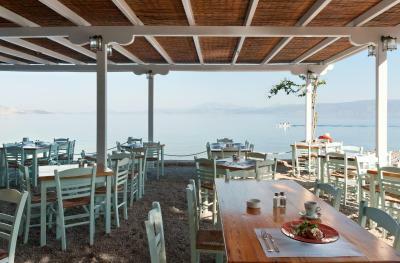 Good breakfast and restaurant right by the sea. There is really nothing not to like at this place where you get a real holiday feel. Perfect choice for relaxation in the sunbeds under the umbrella. Beautiful, elegant rooms. Very rocky beach. Beach shoes reccomended. Very relaxed place. If you want action, then maybe this is not your place. Would be nice to have a return boat shuttle after 20 PM, e.g. at 21:30 or 22:00. Everything. Beautiful place, nice rooms, lovely breakfast and Kind staff. Beautiful house, wiew, beach, comfortable bed and pillow. Helpful and kind staff and transferboat captain. We will come back!